The incentive is a reward for the hospital for upgrading its HVAC controls, thus improving energy efficiency and comfort for patients, their families and staff. When companies consult with Duke Energy before making energy efficiency improvements, it can result in lower utility bills, increased profits and productivity, improved employee comfort and more. Duke Energy's Andrew Taylor, left, and the hospital's Jeff Mace. 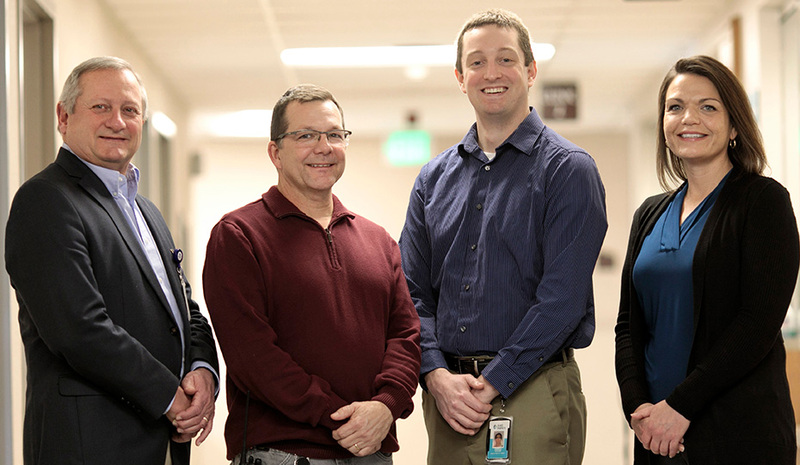 The upgrades represent about $115,000 in electrical savings annually – one-third of the hospital’s energy bill, said Jeff Mace, the hospital’s director of plant operations. Mace expects to get another five years out of the upgraded air handlers. 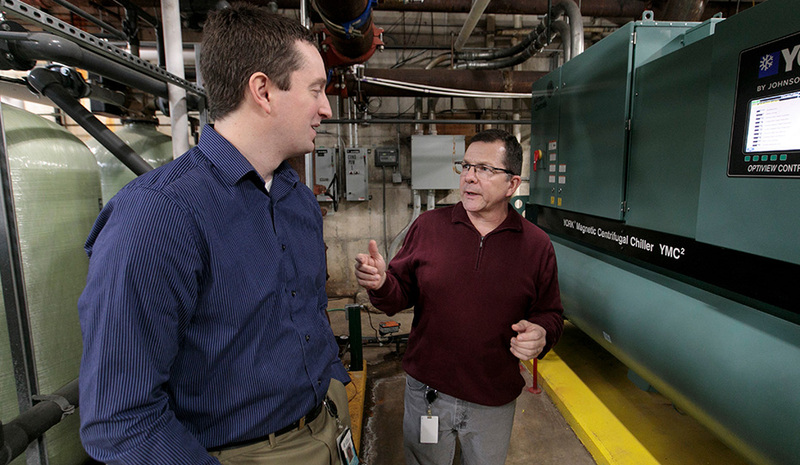 The money the hospital saves in energy costs will help fund new air handlers when the time comes to replace them. “This was a no-brainer,” Mace said. The hospital has taken advantage of Duke Energy’s Smart $aver® rebate and incentive program for smaller-scale improvements over the years, said Jessie Jackman, who works in Large Account Management for Duke Energy Indiana. 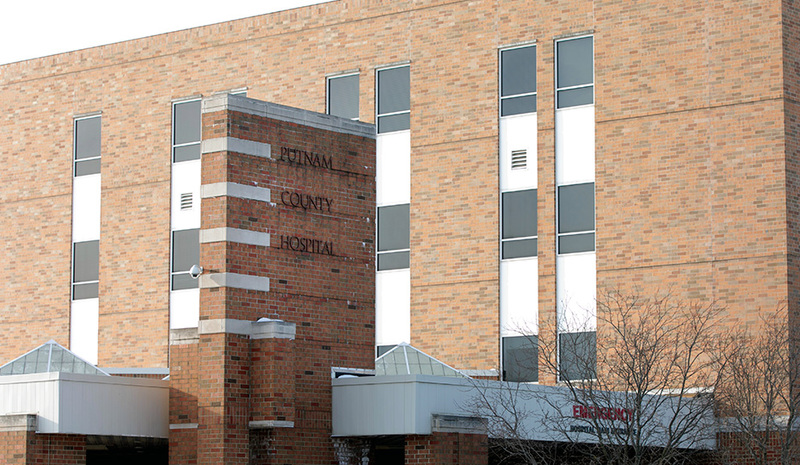 For instance, Putnam County Hospital upgraded its lights to LEDs, improving energy efficiency, reducing energy costs and creating a softer, more pleasant ambiance. They replaced more than 1,200 interior fluorescent fixtures as well as exterior and parking lot lights. The upgrades save the hospital around $60,000 each year on electricity. The hospital has earned nearly $200,000 in incentives from Duke Energy during the past four years, Mace said. For the most recent project, they retro-commissioned the 39-year-old building’s air handling units – all 13 of them – and brought them up to modern efficiency levels. These upgraded systems are equipped with variable frequency drives programmed to deliver only the airflow needed at any given time. In a hospital with a 24-hour emergency department, ICU, surgical suites and more, the old system forced many air handler fans to run constantly, regardless of occupancy. The upgraded system delivers only the airflow needed. Before taking on this eight-month project, Putnam County Hospital worked with Siemens Building Technologies to submit a Smart $aver application. Engineers on the team reviewed the energy savings analysis and sent the application to Andy Taylor, an engineer and Duke Energy incentive program manager, who worked with his team to provide an incentive offer to the hospital to be paid upon completion of the project. Maintaining clean air inside any building is important for the people who work there. So, improvements to air-handling equipment aren’t just saving money. They’re helping ensure a cleaner, more comfortable environment. And on a purely aesthetic level, lighting upgrades – like the ones the hospital made – help create a more pleasant ambiance. No one likes the harsh, fluorescent lighting common in hospitals. Softer LED lighting helps improve people’s moods, which can impact outcomes. After these projects, Mace is looking to the future. "This won’t be the last project we do with Duke," Mace said. "There’s more I want to do." Putnam County Hospital CEO Dennis Weatherford, Director of Plant Operations Jeff Mace, Duke Energy employees Andrew Taylor and Jessie Jackman. Duke Energy offers incentives and rebates for energy efficiency upgrades for businesses and institutions. Florida. Businesses can earn incentives for existing and new construction, including upgrading HVAC equipment (including energy recovery ventilation) or a custom project. Learn more here. Indiana. Duke Energy offers rebates for lighting, HVAC and agricultural equipment upgrades and custom incentives for other upgrades. Learn more here. Kentucky. Commercial and industrial equipment, HVAC systems, lighting – whatever you’re upgrading, you may be able to get a rebate or incentive. Learn more. North Carolina. In North Carolina, as well as throughout Duke Energy territory, custom incentives may be available for installing automation controls, upgrading compressed air systems or implementing other unique energy-efficient technologies. Learn more here. Ohio. In addition to other rebates and incentives, Duke Energy Ohio offers rebates for business customers who haven't received them for eligible equipment installed or retrofitted since Jan. 1, 2014. Find out more. South Carolina. Duke Energy Carolinas customers can take advantage of incentives and rebates through Smart $aver and other programs. Duke Energy Progress offers Smart $aver and other programs for businesses.